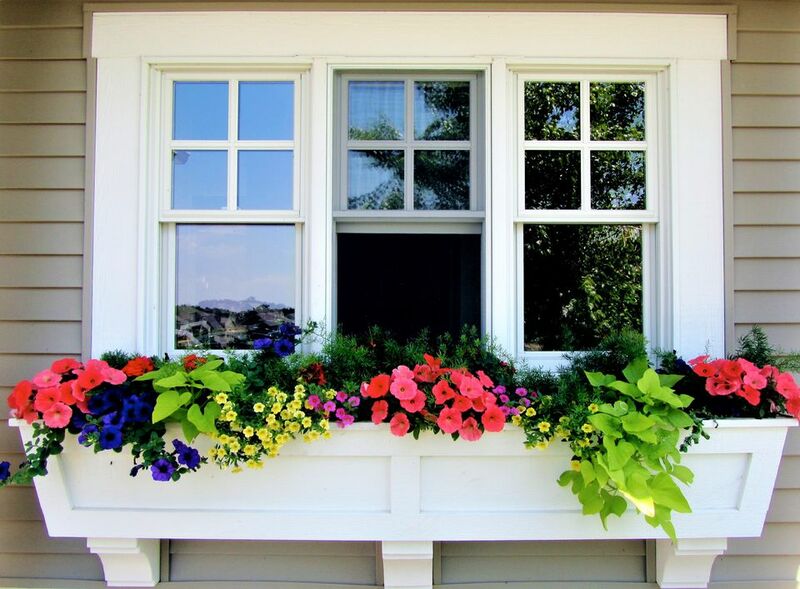 Fun to design, fast to build, and inexpensive, do-it-yourself window box planters are the perfect touch for practically any home's exterior. Showcasing annual or perennial flowers, or even low maintenance vines and succulents, DIY window box planters raise the garden from ground level to window level. Window boxes are both a stylistic touch to the home exterior by adding curb appeal, as well as a clever way to bring the look of plants indoors. While this project features your plants and flowers, the true star is the window box itself. This flexible project lets you have fun finding creative and unique materials to use for your window box. This project is moderately expensive because it uses pre-cut primed trim boards and corbels. It is based on a common window width of 59 inches. However, you can size the window box up or down according to your needs. 3 corbels: Corbels are pre-cut buttresses found at home centers or lumberyards. The corbels will both provide support for the window box as well as give the box an added classic touch. For this window box on a 59 inch-wide window, the total length of the box will be 65 inches. Using the compound miter saw, cut each of the three 8 inch-wide boards to 65 inches long. If you have a window of a different width, go to your home's exterior and measure the width of the window. Take that measurement and add 6 inches to the total. The extra length takes into account the two studs (each 1-1/2 inches wide) that run along the side of your window, plus another 1-1/2 inches for visual effect. The box needs two small boards to act as ends for the box. From the waste lumber you used earlier, cut two boards, each 7-3/4 inches x 8-1/2 inches. Lay one of the 65-inch boards on the ground. Place another 65-inch board against it, so that they are at a 90-degree angle. Nail the two boards together. Do not move this assembly yet. Now, take another 65-inch board and place it in a similar fashion in back and nail in place. You should now have a U-shaped assembly (when looking at it from the end). Use the two boards that are 8-1/2 inches x 7-3/4 inches as end pieces. Orient each one so that the longer side is horizontal and the shorter side is vertical. Nail each into place. Use the drill and a 1/4-inch drill bit to make a series of holes on the bottom of the window box for drainage. Drill roughly 20 to 30 holes and evenly space them. A purely decorative face frame of 1/4-inch x 1-inch boards gives the window box planter its finishing touch. Cut two boards at 65 inches and three boards at 4-3/4 inches. Nail the two long boards lengthwise across the face of the box. Place the three short boards vertically between the longboards, one at each end and the third exactly in the center. Nail all boards into place. Since the wood is already primed, you can paint directly onto it without sanding or additional primer. Let the first coat dry for several hours until it is hard and solid to the touch. Then apply a second coat. Follow the instructions that come with the corbels to attach them to the window box and to the outside of the home. Be mindful of weight restrictions specified by the corbels' instructions. If you wish to keep costs down, for the box, you may alternatively wish to use any of the following materials. Since they come in different sizes than the materials specified in the procedure, you will need to cut them to size them accordingly. Pallet Wood: Found curb-side or behind businesses, wood pallets are a great source for window box materials since they are usually free. Because wood pallets are usually attractively pre-weathered, there is no need to make new wood look old. Fence Boards: Fence boards are one of the most popular "found" materials used for window boxes. If you are replacing a fence, you can pry off individual boards to use when you want the pre-aged look for the planter box. You can purchase new fence boards, as well. Western Red Cedar boards that are 5/8 inches thick, 5-1/2 inches wide, and 6 feet long are a good material for most planter boxes. Unprimed Dimensional Lumber: Lumber that is milled (cut) to size for building materials is called dimensional lumber. Pine, poplar, cedar, fir, walnut, alder, and birch are only a few of the wood species you can purchase in dimensional sizes. Softwoods like pine and poplar deteriorate quickly if left untreated; they must be painted or stained and coated. Expensive hardwoods like walnut and mahogany age well. A good sweet spot can be found with cedar: it's both cheap and it ages well, due to its natural oils. Since the corbels are the most expensive part of this project, alternatively you may wish to use 8-inch metal shelf brackets, which are significantly cheaper.